The world has changed over a period of time and this massive change has showed its effect on the education system also. Due to this, now the schools, as well as the education process, have to be re-imagined. Gone are those days when the learning could happen strictly within the confinement of four walls that were named as classrooms. Today, the learner is dynamic. He is aware. The learner is exposed to information, most of the times unintentionally, during his/her formative years through mobile phones, tablets, computers, etc. Creating this ambiance for our future leaders is the Millennium World School, the best CBSE school near you. Children of 21st century are different. From cradle to career, they are exposed to technology and information and hence, they need new skills as well as knowledge in order to become successful in life. Rather than conceptual learning, it is the skills that are more important to the children belonging to the 21st century so that they can build a future that they have envisioned. There has been a rapid shift in technology from the 20th century. Now, the learners are trying to explore the unconventional fields of photography, writing, retailing, management and so on and all of this requires accessibility to skill-based education. Giving this exposure to our children becomes imperative and that is why the Millennium World School is more of an experiential learning school, with an innovative curriculum and of course ranked among the top 10 CBSE schools in India. Conventional education prepares the children in their core subjects but the need of today’s world is skill application. The learner in order to survive in this fast growing and competitive world should be endowed with the skill of problem solving as well as critical thinking. We have to prepare the learners of the 21st century for jobs and technologies that don’t exist right yet. Hence, the learners have to be creative and should be willing to collaborate with others so that holistic learning could take place. Even the schools are also bringing a complete shift in their paradigm. The normal blackboards are replaced by smart learning boards. Rather than learners being a passive listener, interactive and online modules are taught in the class so as imbibe the learner with the skill of analytical thinking. In today’s scenario, the whole aim of education should be that the child is able to seek reason behind everything rather than just rote learning it. Preparing the children for future is Millennium world school, the best private school in India, offering a world of opportunities to every child. Recently, a 15-year old class XI student, developed a ‘Password Management System’ mobile application that helps the users to store their passwords and avoid the theft of data. This has become possible because the 21st century learner is thinking beyond the boundaries and in order for this to happen, the schools have to take a leap of faith. With Internet breaking classroom barriers and introducing the learners to a whole range of courses, virtual classrooms are adding a whole new value to the future of 21st century learners. 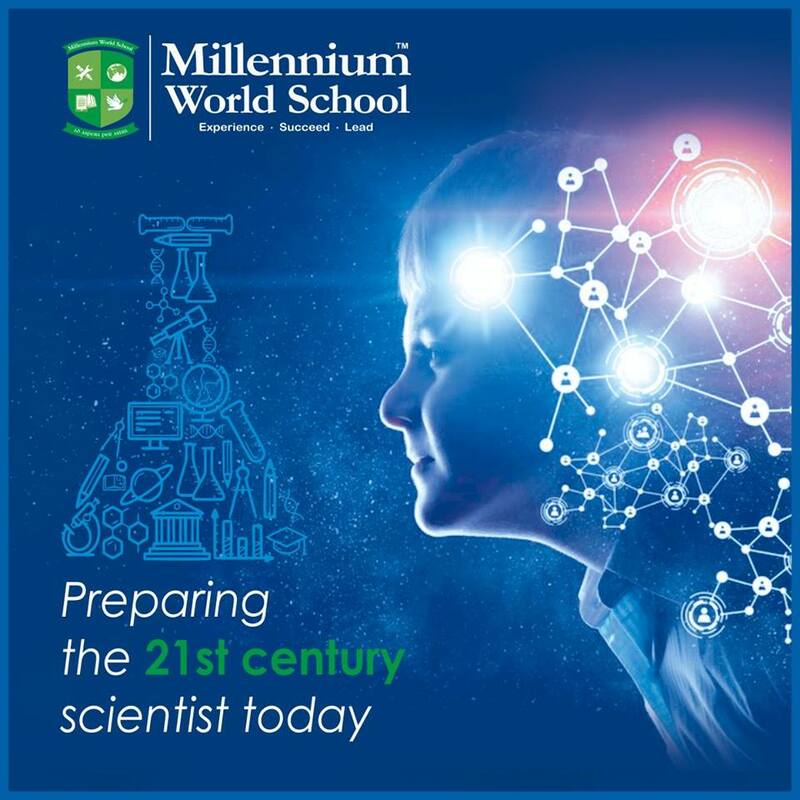 Let your child be a millenniumite breaking all barriers to conventional learning and achieving the best at the Millennium World school in 2019. Hence the need of the hour is to empower the learner with skills that help them think beyond the confinement of syllabus. Children should be exposed to opportunities during their formative years in the school that helps them to reason, think creatively, analyse the information and thereby work collaboratively in the future. Education has been the backbone of Indian society since the days of yore. In fact, it is the Indian civilization that gave mankind the concept of Gurukul, teacher-student relationship and much more. Today we are approaching the 21st century and a lot has changed. Even the education system has gone for a 360-degree shift. With globalization, technology and advancement knocking at our doors, education has to be revamped and remodeled. Now only conceptual education isn’t in a position to make our future generation knowledgeable. There is a need for something else and that is ‘Skill Based Education’, which is what we the Millennium World School, India’s best CBSE school today, is talking about. A recent survey from MHRD (Ministry of Human Resource and Development) proves that there are approx. 1.3 million schools in India which are providing traditional education to over 228 million students. However, the most shocking fact is that almost 56.8% students discontinue from regular schools before they have even reached Class X. In today’s scenario, skill-based education is the need of the hour and what more can one ask for when the school which is ranked among top 10 CBSE schools in India, Millennium World School, opens doors to such opportunities. In order to achieve ‘holistic learning’, there should be a right mix of knowledge as well as skills. The desire to achieve and celebrate each moment, inculcating values, enhancing skills, catering to the need of every child through a VAK based approach, linking concepts to real life projects, encouraging critical thinking and problem solving and a whole world of opportunities, Millennium world school has left no stone unturned to ensure that learning becomes a life time experience for your child. However, just prescribing skill-based learning in current curriculum won’t solve the problem. The students have to be made duly aware about them. Awareness about skill-based education can bring about a positive shift in making the learners aware about the actual job scenario by giving them an insight into the real work environment in the industry. Millennium World School caters to individualistic need to make the books visually appealing, activities to make the classrooms more joyful and engaging, teaching-learning strategies which give a new meaning to concepts, child-centric assessment systems and a 24/7 support in mentoring and audit which empowers the team of facilitators and supports the school in moving forward at every step. Making our future leaders visionaries and futuristic in approach, progressive in thought and giving your child the exposure in the best English medium school near you, is imperative and a decision you must take on. So, it is time that we should start building awareness among the learners highlighting the career opportunities that skill-based education would offer to them in the present global market. It is, therefore, time for students, parents, authorities on their part to understand the importance of vocational education and take the necessary steps towards adopting skill-based education. This could in turn work as a solution for the large unemployed labour market of India and therein help propel the country towards better progress and prosperity. Hence, skill-based education is need of the hour unless we want to see a nation full of unemployed and disappointed youth or worse, the youth moving to other countries where their talent is appreciated as well as needed. Let the best K 12 CBSE school help your child achieve their dream and fulfill their aspirations every day. Become a proud Millennium parent and join the network of millenniumites today. learning is best when it’s done the Millennium way. 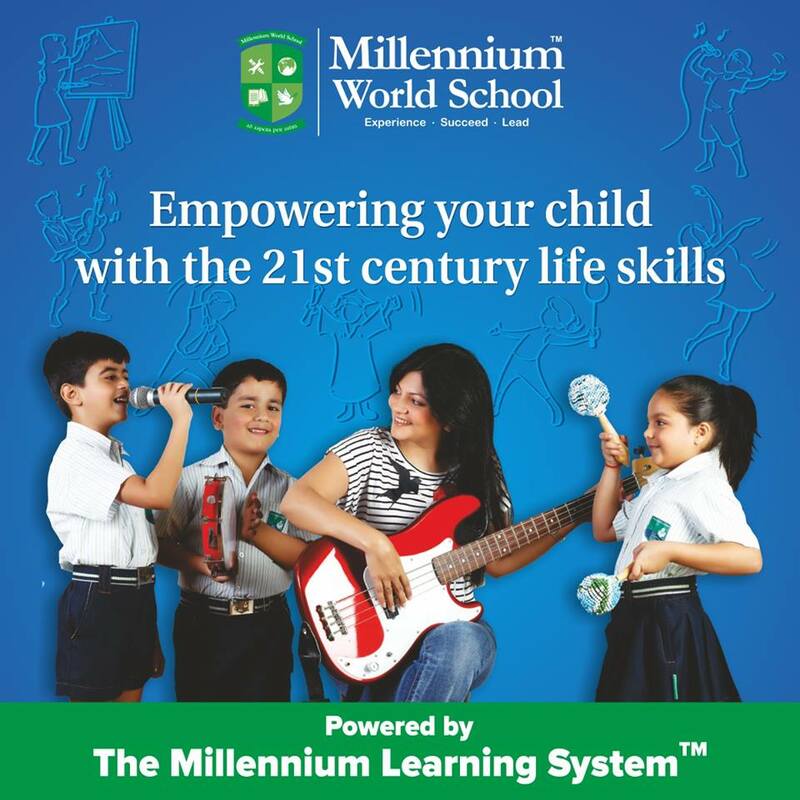 Millennium World School, marks the beginning to a new journey for your child. It’s not about which location, which board, which book or which curriculum. It’s about the most beautiful creation of God, your child; who deserves the best and nothing but the best when it comes to education, empowerment and excelling in life. Opening the doors to a beautiful world of opportunities is the best CBSE school now near you. Keeping the children safe and warm, empowering them with skills to apply the knowledge they gain, and become sensible and sensitive citizens making a global impact; is a mission that we have taken on this 2019. Education is a beautiful tool to change the mind and it’s only when the mind changes does the society change to being progressive. Children today are street smart, more exposed to the outside world at an early age and more aware of their needs and aspirations. The sky is the limit when it comes to opportunities that they seek for their future. Our education system should then be such as well which caters to this need of the hour. It should be holistic, no doubt, but interesting. It should be catering to the aspiration of every parent seeking the best English medium school near them. It should have an interesting innovative curriculum which is age appropriate and brings out the hidden curiosity in every child. That is exactly what The Millennium learning System does to your child. 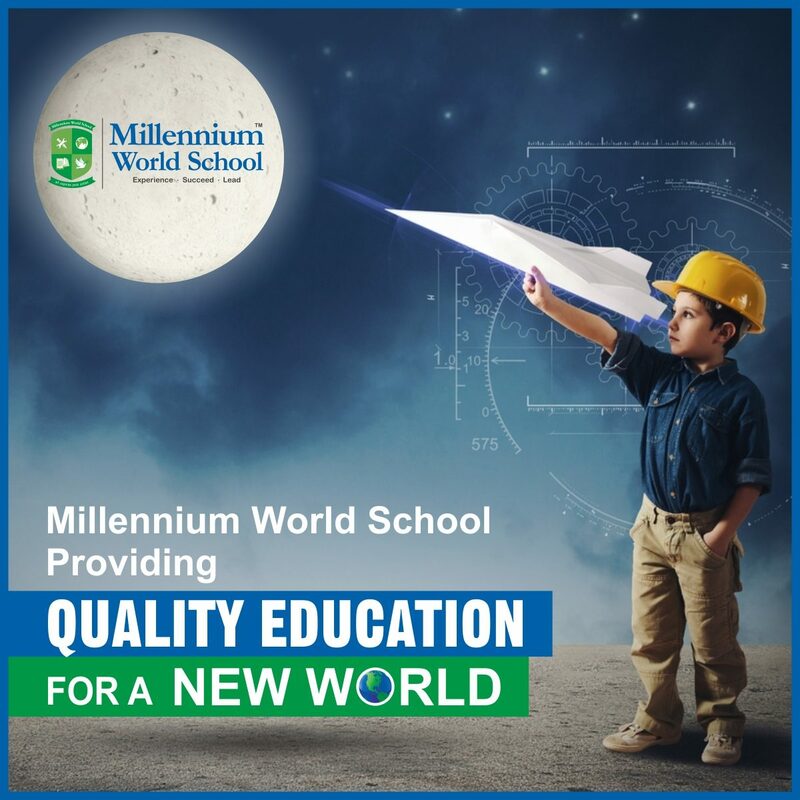 Taking them to the next level of learning, creating an impact and building on their innate potential, Millennium world school is surely the best K 12 school near you. Let your child grow, enjoy and understand the true meaning of being educated. Let your child move beyond books, beyond the four walls of a classroom and fly in their world of dreams. Let us, then as an education space and you as parent, ensure that we give our children the wings to fly and achieve their aspirations, to dream big, to make the impact through education which is global , meaningful and full of experiences which only make your child smile. Happy faces happy school happy parent and a dream fulfilled when you become a Millennium family member. Join a millennium world school and be a proud parent. See your child grow, think and question every aspect in life and be a leader who knows the rules of the game. We leave you on this note to reflect what your child will get by being a Millenniumite. An empowered future or a restricted structure in the mind? Let the journey begin with your one step today.